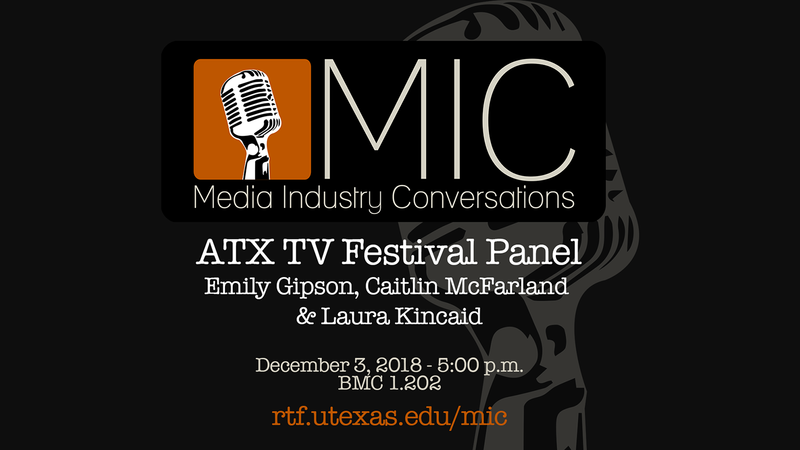 When: Monday, December 3, 2018 - 5-6:15 p.m.
Emily Gipson (Founder/Co-Executive Director), Caitlin McFarland (Founder/Co-Executive Director), and Laura Kincaid (RTF BS ‘06, Director of Operations) of the ATX TV Festival discussed their career trajectories, their roles and responsibilities with the festival, and their views on the current state of both the television industry and TV festivals. Emily Gipson is the co-executive director and co-founder of ATX Television Festival, a four-day celebration that consists of panels, screenings, and events where attendees and leaders in the TV industry talk, watch, and experience television together as one community. Originally from Wichita Falls, Texas, Gipson graduated from TCU in Fort Worth before moving to Los Angeles where for almost a decade she worked on the studio and network side of the entertainment industry, including Twentieth Century Fox Film, TLC, Discovery Communications and Fox TV Studios, with positions spanning marketing, finance and business/legal. Gipson is a pop culture fanatic, avid traveler, and, of course, obsessed with TV, which drove her to co-found the ATX Television Festival in 2011 with a Kickstarter campaign. With 700 people in attendance its first year, the festival has now grown to 3000 attendees, and has featured numerous epic reunions including Gilmore Girls, The West Wing, Ugly Betty, and a Friday Night Lights 10-year anniversary celebration on the Dillon Panther Football Field (to name a few). Leading ATX into its sixth season, Gipson remains passionate about growing the Festival to its full potential, while also keeping it an intimate and accessible place for fans and industry to come together. Gipson, along with her ATX co-founder, Caitlin McFarland, has also launched into development with their production company No Mondays Productions, as an outlet to create the television content about which they are passionate. Caitlin McFarland is the co-executive director and co-founder of ATX Television Festival, a four-day celebration that consists of panels, screenings, and events where attendees and leaders in the TV industry talk, watch, and experience television together as one community (a.k.a TV Camp for Grown Ups). Originally from The Woodlands, Texas, McFarland graduated from Whittier College's Scholars Program in Whittier, CA before starting a career in the film and TV Industry in both Los Angeles and New York. For almost a decade she worked with directors and producers on both Film + TV projects, including Nora Ephron, Mira Nair, and Betty Thomas. In addition, she also worked on both the festival and filmmaker side of festivals like TriBeCA Film Festival, Doha TriBeCa and Sundance Film Festival. McFarland co-founded the ATX Television Festival in 2011 with a Kickstarter campaign. With 700 people in attendance its first year, the festival has now grown to 3000 attendees, and has featured numerous epic reunions including Felicity, Gilmore Girls, The West Wing, Ugly Betty, and a Friday Night Lights 10-year anniversary celebration on the Dillon Panther Football Field (to name a few). Leading ATX into its eighth season, McFarland remains passionate about growing the Festival, while keeping it an intimate and accessible place for fans and industry to come together. McFarland, along with her ATX co-founder, Emily Gipson, have launched into development with their production company No Mondays Productions, as an outlet to create the television content about which they are passionate. In addition to launching their inaugural podcast, The TV Campfire with original episodes and live panels from the festival's past season. Laura Kincaid is the Director of Operations for ATX Television Festival in Austin, TX, where she oversees logistics for the annual festival, a four day celebration of all things television, as well as year round events. Laura was formerly the Senior Marketing Coordinator at the Texas Film Commission, a division of the Office of the Governor, where she worked with film festivals, non-profits, and events across the country. While at the Film Commission, Laura started Austin.Women.Film., a monthly gathering of women in the entertainment industries that seeks to create a friendly and casual environment for women to both reconnect with past industry contacts and expand their network. She is a native Austinite, graduated from the University of Texas at Austin in 2006 with a BS in Radio-Television-Film, and has co-edited numerous short films - as well as one very long documentary in French, Arabic and Portuguese, none of which she speaks.